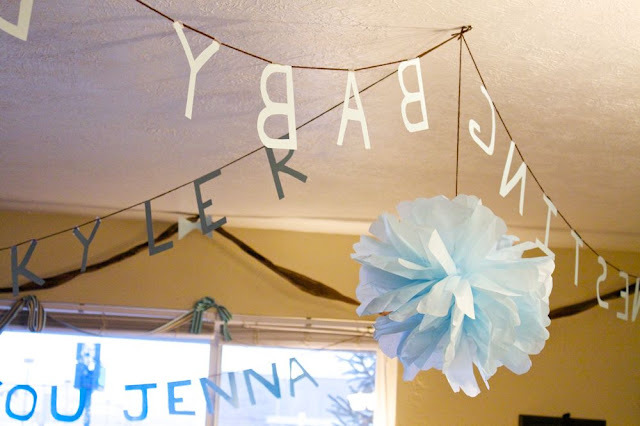 Thank you all so much for your wonderful ideas for the baby shower. It's done! Everything went wonderfully, we had such a great time, and I couldn't have done it without all of your wonderful suggestions, so thank you! I don't remember who's ideas I borrowed exactly, it was kind of a whirlwind, but I did decide to go with the "feather her nest" theme! And the word garlands! So fun! They were little nest inspired flower brooches with "eggs" (pearls) in the center. I didn't get a very good picture of them, but they were pretty! And I made a little note tree from branches off of a huge weed in the field behind my yard . 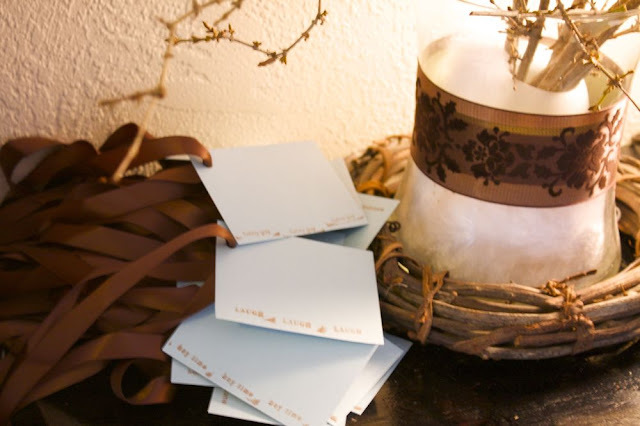 With note cards made from blue card stock that I had on hand, stamped with little boyish sayings, and tied with brown satin ribbons. 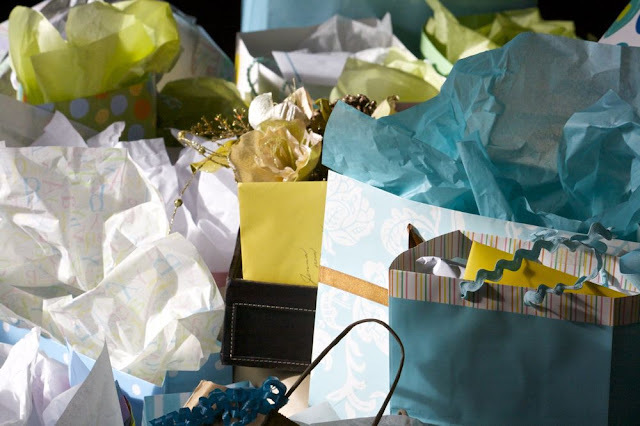 I think presents are a decoration in themselves! I love all that pretty packaging! I also gave her a necklace which I got from a wonderful jewelry designer online, but it will get it's own special post soon. 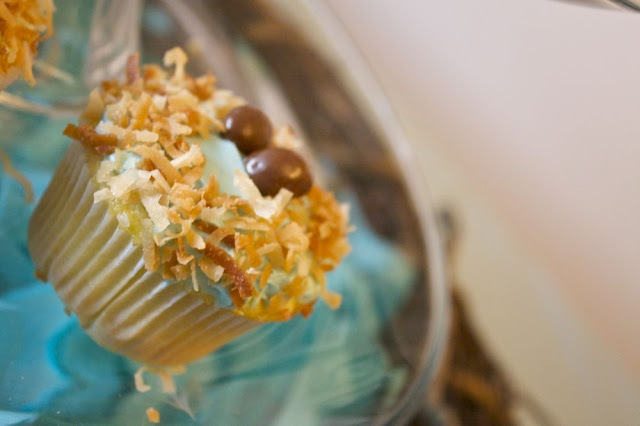 The greatest part was that I had everything on hand, so the only money I spent on the shower was on the ingredients for the cupcakes! Wonderful! And now I'm going to take a beautiful, lovely nap. Thanks again for saving the day with all of your ideas guys! You're the best!! I love the theme that you chose! good job! everything looks so great! i'd never guess that your budget was zero. I love love love your blog. Thank you for sharing your ideas. The shower was lovely! Your readers posted some super ideas. lol POMS! 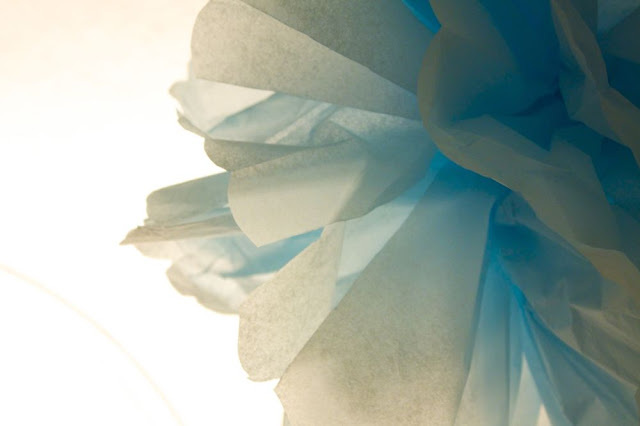 That's what I meant when I said, "tissue paper thingies!" I'm such a goober. The shower decorations look divine! (nice POMS, btw!) 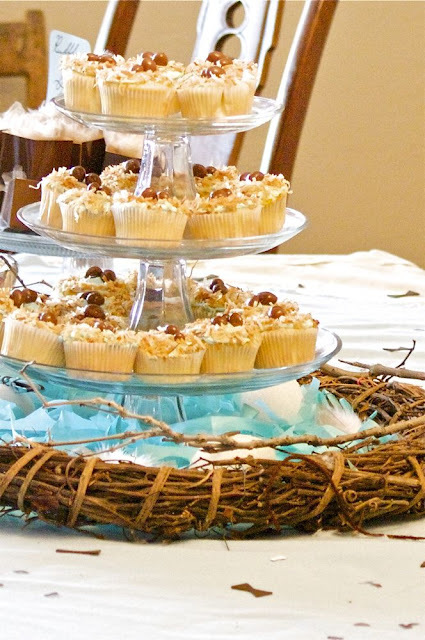 I especially love the bird's nest cupcakes! holy cow woman!! That is an AMAZING shower for "thrown together"! And the fact that it looks super high class (like a pottery barn baby shower, if you could buy them there!) but you spent NO money on it?! That makes you my hero. You totally rock. Can I be you when I grow up? Absolutely beautiful Disney! 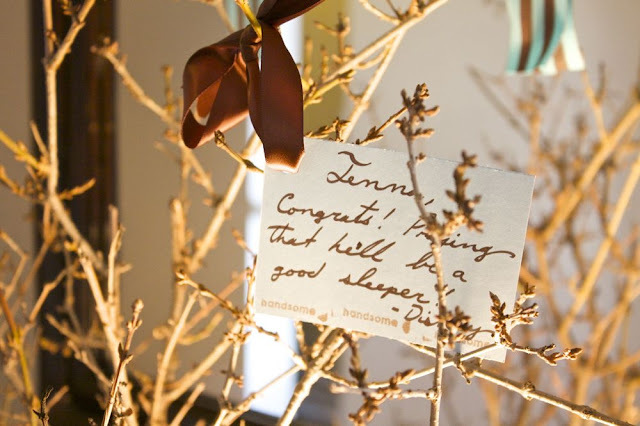 I love the word garlands, the favors, and the little branches... Nice work! I would have been up until 4 AM doing all that. Great job! Wow! You pulled together an amazing shower in such a limited amount of time. Great job. You did a great job with all the tips! Great pics by the way!!! Wow. I am so super impressed by how you pulled it all together and made it look beautiful! Especially with just buying cupcake ingredients. Thank heaven for bloggers and their wonderful sharing of iddeas. I can't believe you threw this together in 2 days! WOW! you are amazing. 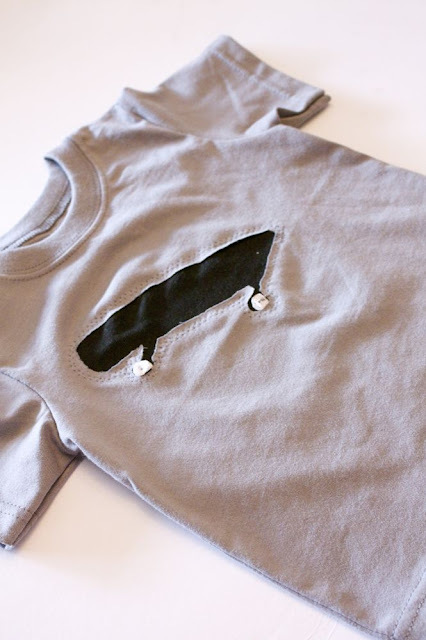 so cute and clever. What a beautiful shower. You are amazing. So fabulous!! Did Jenna enjoy herself at the shower? I hope that when I have a baby I have someone as creative and caring as you on shower duty! Wow Disney! You just did such a good job!!!! Can you come over (to Spais) to help me host one this summer?? Hahaha! Can I ask you a little question??? 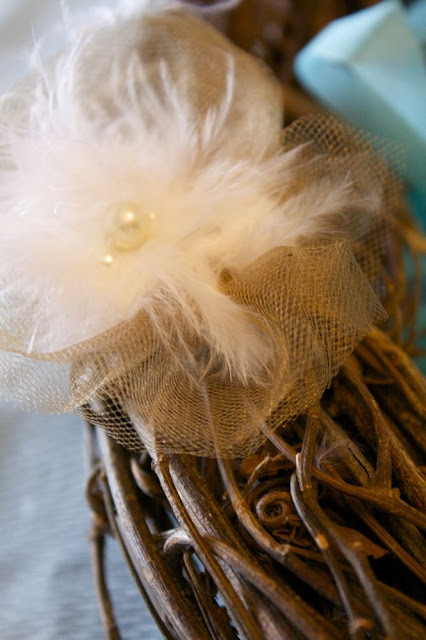 How did you attach all the feathers together and them add the tulle and the pearl? Did you use a cardstcok or a metal piece underneath? Wow - everything looked amazing. You never cease to amaze with your creativity. What a lucky friend. oh, how beautiful!! you did an amazing job! What great ideas! And so thrifty! LOVE the wreath made to look like a nest under the cupcake stand!!! What a great theme and play on words! 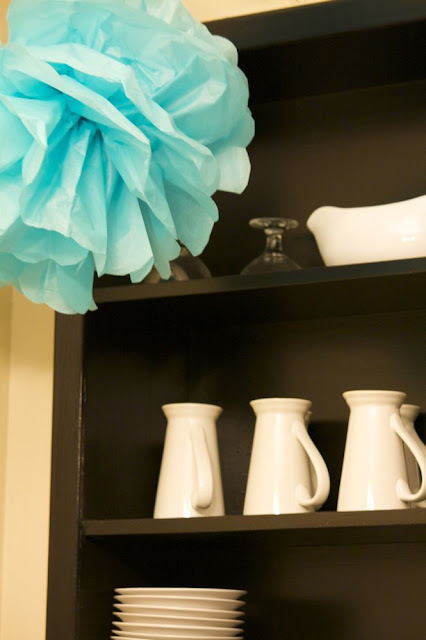 I have to host a baby shower in June and I would love to see how to make those big pom poms! Can you do a post on those??? Pretty please?! Everything turned out beautifully! Wow it certainly looks wonderful, what a fabulous thing to do for your friend, I hope she appreciated all your work and I hope everyone had a wonderful time. I love Martha, we don't get her here in Australia but I have seen her show when in the US and regularly visit her website. How did you do the marth poms and the string letters? will u post it on your blog or email me at kelster5@aol.com? love your blog and amazing ideas!! You did it!! I love everything. 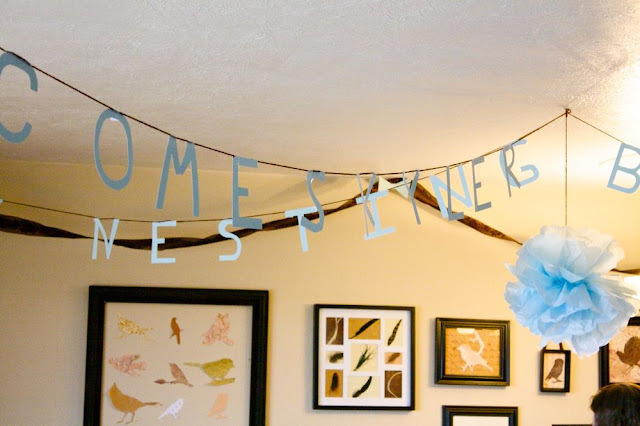 Those saying strung across the ceiling are awesome. Great job!! Hi I think you did a wonderful job!!! It would be amazing if you could post a tutorial of something or everything or post the links. It looks like everybody had a great time, congrats!!!! 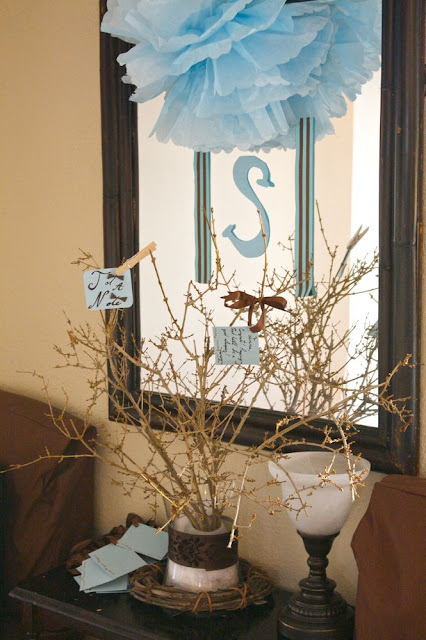 Beautiful...it makes me want to have another child just to be able to arrange such a beautiful babyshower. The broaches are so pretty! You did a great job with the limited time and budget...I've bookmarked your post for future reference. Thanks. Great Job! I love a wonderful & Creative Party! Too cute! You pulled it off. This party could be in a magazine. I came across one of your pictures on oneprettything.com. I just wanted to say how much I loved your creativity with this theme. I think everything looks amazing. I love love love your blog. and i love love love those feather pearly pins! (or are theyr hair accessories?) do you mind doing a tutorial on them? 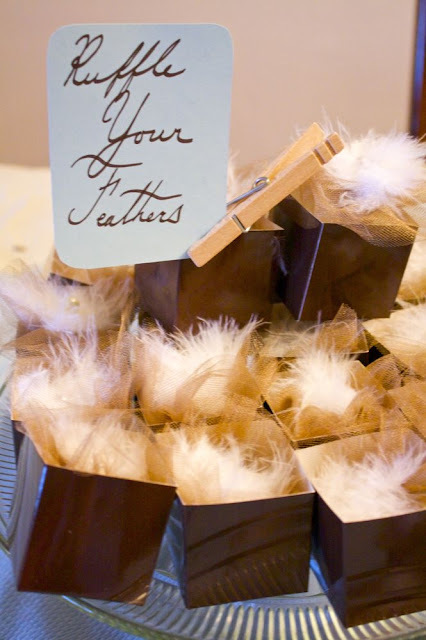 i woudl love to see how you got the feathers to stick together without a gluey mess.